We have been selling hot tubs in Orange County since 1988 and nobody knows their hot tubs inside and out like we do at Coastal Spa & Patio. 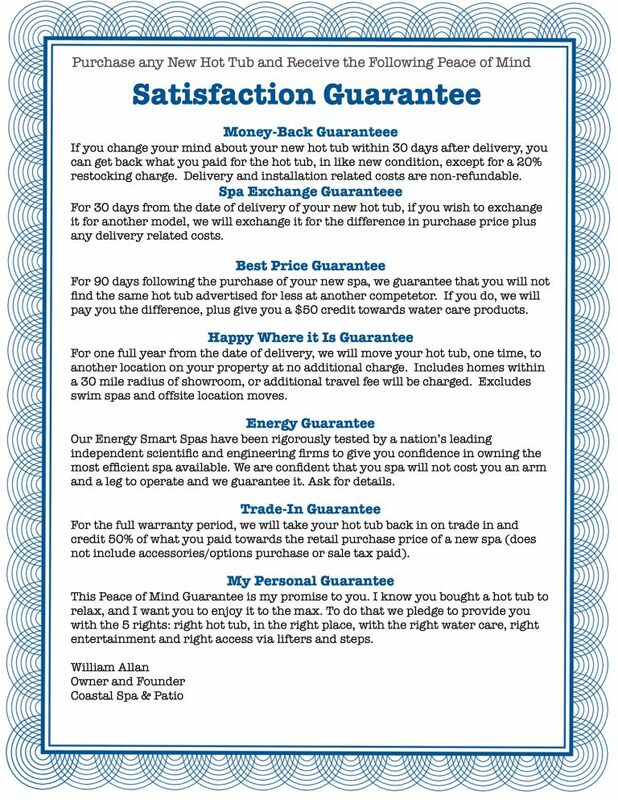 Because of this, we are in the unique position to offer a one of a kind Exclusive Satisfaction Guarantee, that you won’t find anywhere, which is designed to give you peace of mind when selecting a hot tub for your backyard. If you change your mind about your new hot tub within 30 days of installation, you can get back what you paid for the equipment that is in like new condition, except for a 20% restocking charge. Delivery and installation related costs are extra. For 30 days from the date of delivery of your new hot tub, if you wish to exchange it for another, we will exchange for the difference in purchase price plus any delivery and installation related costs. For 90 days following the purchase of your new hot tub, we guarantee that you will not find the same hot tub for less. If you do, we will pay you the difference, plus give you a $50 credit towards water care products. For one full year from the date of delivery, we will move your hot tub, one time, to another location on your property at no additional charge. Includes properties within 30 mile radius of showroom, or additional travel fee will be charged. Excludes swim spas. Our Energy Smart Spas have been rigorously tested by a nation’s leading independent scientific and engineering firms to give you confidence in owning the most efficient spa available. We are confident that you spa will not cost you an arm and a leg to operate and we guarantee it. See Energy Guarantee Certificate for full details. For the full warranty period, we will take your hot tub back in on trade in and credit 50% of what you paid towards the purchase of a new hot tub (does not include sale tax paid). This Exclusive Satisfaction Guarantee is my promise to you. I know you bought a hot tub to relax, and I want you to enjoy it to the max. To do that we pledge to provide you with the 5 rights: right hot tub, in the right place, with the right water care, right entertainment and right access via lifters and steps. 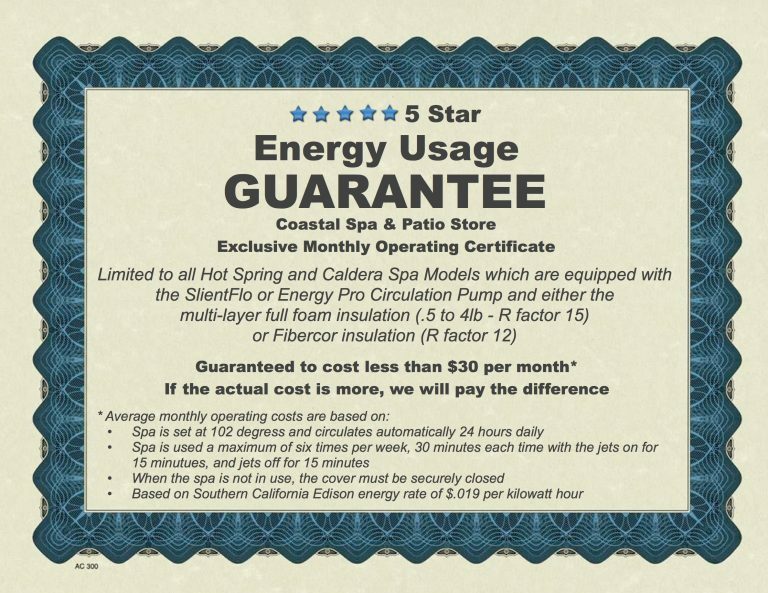 If you have any questions about our Exclusive Satisfaction Guarantee, please give us a call at 714-693-3404.